Minnesota Golden Gophers head coach Jerry Kill walks on the field before the Texas Bowl against the Syracuse Orange. 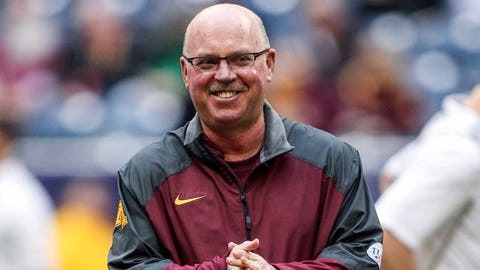 For the first time in nearly three months, Gophers coach Jerry Kill is back on the sideline. Kill, in his third year as the head football coach at Minnesota, began Friday’s Texas Bowl game in the press box. He spent the last six regular-season games up in the box after taking time away from the team to focus on his epilepsy treatment. When Minnesota won four games in a row with Kill watching from the box, the Gophers opted not to change things up, in part for superstitious reasons. He remained upstairs during Minnesota’s final two losses to Wisconsin and Michigan State and was in the box again for the first half Friday. With the Gophers trailing Syracuse 7-3 at halftime, Kill opted to come downstairs and spend the second half on the sideline. The last time Kill coached from the sideline was Sept. 28 in Minnesota’s loss to Iowa. He missed the Gophers’ following game at Michigan after suffering a seizure in Minneapolis prior to the game. It was the third gameday seizure during Kill’s three years at Minnesota. He has since taken a step back to key in on his treatment, with defensive coordinator Tracy Claeys serving as the acting head coach. Claeys remained on the sideline in the second half Friday along with Kill.